Photo courtesy of Taj Davis. Found at guest house in Kratie, Cambodia. You can never have enough plankets. Do not use the toilet with the non-hole. If you pour the water, it will make the room non-claen. You forgot to stick up your key. I have the right to remain islent and also disturb others. Then I walked out into the night to lock the door from 7.00 to 11.00. If the toilet must pour the water and claen why should I bother to look after the hygiene in the room is like? “If you have the special things such as: Gold, Buck and other thing to keep oneself”. … Oh the suspension… then what? what? How do I turn off the too? The non-hole of water … must be one of those quantum physics holistic zen things. If you don’t follow the rules, they make you walk the planket. 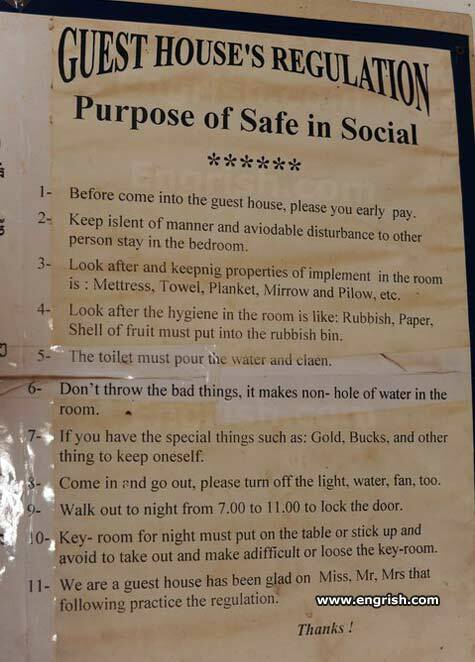 Look after the hygiene in the room is like Rubbish? That’s useless to clean the room then. I can trash the room now. Can I throw the good things? 12 – Don’t piss in the sink you may want to wash your socks in it later. Man, that’s the longest (and hardest) way to simply lock the door: walk at night for 4 hours. Ehh? Where am I supposed tio stick the key up? The purpose of safe in social, is to always wear a condom. If I ever have five cats, I’m going to name them Mettress, Towel, Planket, Mirrow and Pilow. @jjhitt What is the sound of one non-hole pouring the water? OMG! Where do I even begin on this one. ROFLMAO!!!!!! Don’t be such a non-hole ! Wilcome to oura Veitcong prison hotel. Stick ’em up! I’ve got a key-room and I’m not afraid to use it! Your fortune is mine! AI toilet is yuors! this no rubbish! offer all claen! Stop throwing the bad things, you non-hole!! But I don’t want to keep the special thing to myself….it’s so special, I MUST share it! If you have the special things such as: Gold, Bucks and other thing please you early pay. …but I want to throw the bad things! Fine. I’ll just leave! If I had gold and bucks to keep myself, I wouldn’t be staying here. Hey Mr., you get glad on me again and I’ll jam your special thing up your non-hole! So if I’m supposed to walk out tonight to lock the door how do I get back in? To night I don’t throw the bad things explode river duck! I avoidable 7-11 makes non-hole of water adificult to explode. Only claen Gold Buck things to oneselveses! So, I’ve got a stupid little rule sheet ordering me out of the room between 7 and 11? I’m gonna throw a bad thing! I should keep my male deer to myself. Keepnig properties and islend of manner makes non-hole of water in the room to stay* in the bedroom. But if I must keepnig properties and the toilet must pour the water and claen, who will walk outside to lock the door then?! Non-hole of water is makes out the room…! In this guest house, one just can’t keep oneself an islent of manner. I also want a toilet who must pour the water and claen! Mirrow, Mirrow, on the warr! Who’s the plettiest of them arr!